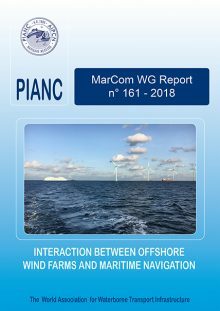 This report provides an approach, guidelines and recommendations to assess the required manoeuvring space for ships in the vicinity of offshore wind farms (OWF) and the minimum recommended distance between shipping lanes and sea areas for OWF in order to ensure a minimal risk to navigation. The report specifically addresses issues with OWF but these are a subset of Offshore Renewable Energy Installations (OREI) and some of the recommendations will have a wider application to other OREI. This report is intended as a guide for the Marine Spatial Planning (MSP) of any Coastal State covering the identification of wind farm areas and the design, planning, construction, operation and dismantling of a wind farm. Increased activity within Europe’s marine waters has led inevitably to growing competition for maritime space. Competing claims from a range of activities, including fisheries, leisure navigation and locations allocated for military exercises, old ammunition dumps, navigation and anchoring areas, oil and gas exploitation, sand extraction and wind and wave energy generation are accompanied by increased pressure on vital marine ecosystems and habitats. Without the means to coordinate a common approach to the allocation of maritime space among different sectors, the problems of overlap and conflict between sectors and individual stakeholders is evident. There are also cross-border issues as developments in the maritime area of one country may well have impacts for another. The relatively new notion of Marine Spatial Planning has emerged as a means of resolving conflicts over maritime space. In order to increase the amount of electrical energy produced by environmentally friendly means, some coastal states have decided that a significant part of the total yearly consumption has to be produced at sea. Production areas are preferably located as close as possible to the shore in order to achieve low transmission costs. For those areas which are situated between or near shipping lanes, there is a potential conflict between shipping and the production areas. Offshore Wind Farms (OWFs) have specific issues where they are in conflict with traditional activities such as navigation. When a sea area for the production of energy of considerable size is located close to a navigation route junction or converging area of ships’ routeing or in any other way in the vicinity of ship’s routeing systems or shipping lanes, it is necessary to maintain the risk to shipping at a minimum but certainly not higher than the present level of risk. In some countries navigation within the borders of an OWF is allowed; in that case crossing traffic can be expected to emerge from the wind farm. In particular, when an OWF is located at the starboard side of a shipping lane, the Collision Regulations (COLREGs) state that vessels in the shipping lane must give way to vessels emerging from the OWF.